Summer, Summer, Summer Time! Time to have a 99 and play a slots game online at Wizard! For any non-english players, a ‘99’ is what we call an ice-cream. The reason it’s called this is that they traditionally cost 99 pence. These days however they are much closer to around £1.30. 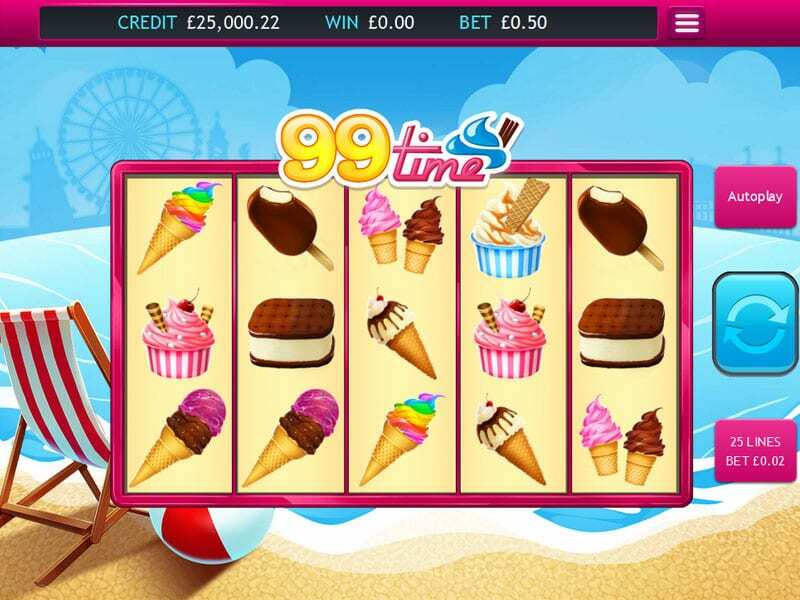 Nevertheless, these ice-cream themed 5 reel online slot games are a perfect getaway filled with ice-cream cones, trucks and plenty amounts of free spins. Eyecon was founded in 1997 as a computer games developer and it wasn’t until 1997 when they first embarked on their journey into online slot games. Ever since they have developed timeless online slot games, becoming very popular among players, offering a great variety of games with some extremely diverse themes. All their games have been created with their players in mind, creating games they love. 99 Time is one of the best slots games to play if you are in need of a great holiday or a relaxing visit to the beach. And who doesn’t love a beach day or a delicious cone of ice-cream? This is exactly what this game is about; transporting you to a wonderful beach scene where you’re eating ice-creams and sunbathing. The background is a nice beach setting and across the 5 reels and 3 rows you will find 10 different ice-cream cones and wafer combinations that are the symbols of this game. There is everything you would expect to find in an ice-cream van rolling onto the beach, from chocolate popsicles to the most rewarding classic Mr. Whippy-style 99 that can land you a win of 200 times your stake. If the ice-cream van rolls over one of the reels and parks in a position on each symbol then you will discover the wild symbol of this game. It replaces everything except for the scatter and doubles all the payouts of any winning paylines in which it appears. If you are lucky enough and three or more vans roll up the beach during the same spin you will trigger the free game feature and win 15, 20 or 25 free spins along with any winnings that come from your stake. The free-spins feature also rewards you with a tasty topping as all of your winning combinations will be boosted by a 3x multiplier. Free spins can also be re-triggered and can add up to 400 free spins in total. Also, look out for the Ice-cream man, he is the scatter of 99 Time and if you land three or more of him in the same spin you will be taken to a fun mini-game. The Ice-Cream Maker feature gives you the opportunity to play as the ice-cream man and create your own delicious ice-cream combination by picking cones, flakes, wafers, fruit, and sprinkles. Every pick of yours will be rewarded by a bonus prize of up to 100 times your total stake. With 25 paylines, exciting bonus features and loads of free spins you can easily make this game lucrative and earn some tasty awards. Place bets for as little as 25p or up to £12.50 and you can buy yourself some nice vacation time and discover the variety of ice-cream choices this game offers. The aesthetics are very nicely done, in a simple comic style and with a wonderful colour palette that will make you wish for an ice-cream while playing. The chances of being rewarded with a heap of free spins are high and the mini-game gives a nice twist to the game that enriches your gameplay experience. 99 Time has a very relaxing theme and will immerse you deep into that holiday feeling that we all crave. Now try our electric sam slot.